Update 4/11/12. If you're looking for what I think about this beer in 2012, check here. But you should totally read the review below first. Last night around 9 pm, I was minding my own business, watching the Phillies and drinking a much-deserved second, OK fifth, beer. That's when I stumbled into this phenomenon known on Twitter simply as #WineParty. Not knowing anyone and being super shy, I asked host Kit from the Blogging Dangerously blog what I was supposed to do. Luckily, she gave me some instructions that I could handle: stalk the conversations for something interesting and with potential. At some point I learned one of the rules at the party was that no bras are allowed, which suited me just fine. And when I realized that the party was made up almost exclusively of hot moms, jackpot! Today I'm drinking Shiner Ruby Redbird brewed by Spoetzl Brewery in Shiner, Texas. 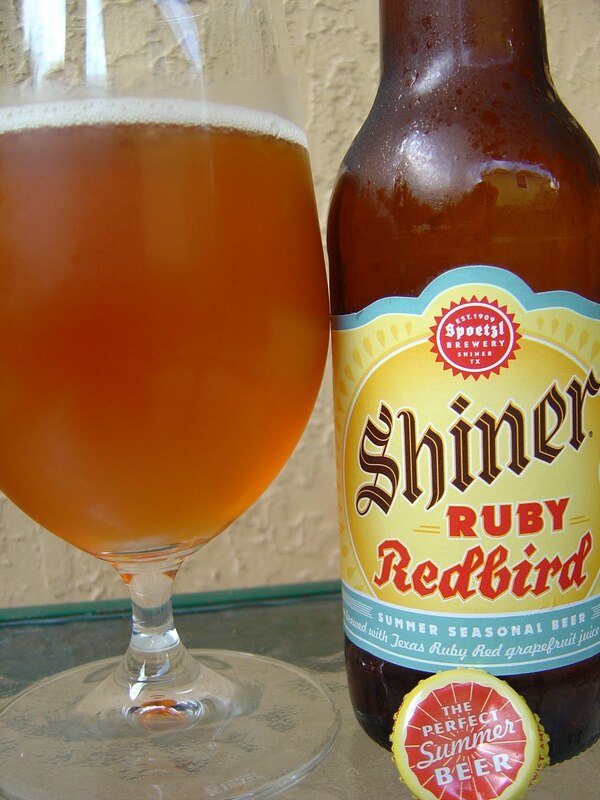 "The Perfect Summer Beer" is brewed with Texas Ruby Red grapefruit juice and ginger. There is a little story on the back covering expectations headlined with "Serve Ice Cold On Hot Days". A little grain with noticeable lemon and grapefruit citrus aroma, not too strong. Tart yet sweet grapefruit flavors start things off. Very dry. Very, very dry. Oh, and surprisingly flat and lacking much carbonation. Next, flat ginger ale hits your palate, with a not-so-powerful ginger component. 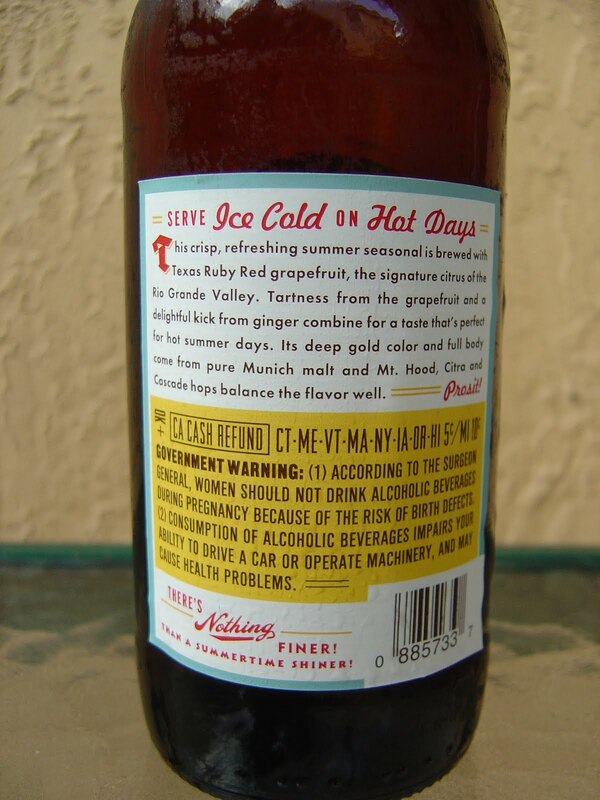 Then there are no other flavors, just a tingle on the palate and more dryness. You know it's beer but that's it. Refreshment-wise, was OK. There are many better beers including half a dozen Shiners. I LOVE anything Shiner. It's been my beer since college, and the brewery is a gem to tour. I'll have to check this one out. Congrats on popping your #wineparty cherry! Shiner is generally solid. We've only been receiving them in S. Florida for a year or so now, but I've traveled to Texas a number of times before that started. Of course, Shiner is the goto beer in many a place. Bummer from a usually legit brewery. Yeah, Shiner is usually decent. This was OK but I prefer others for sure. Just had one today and couldn't disagree more. Granted, I'm not a big beer drinker and prefer my beers light and dry, but I think this would be perfect for a backyard bbq. Awesome. Light and dry it is. Those are two fine qualities for me as well but I'd have preferred a little more flavor. Enjoy the summer. I live in Texas and love my Shiner beers, pretty much all of them. And this is my new favorite for the moment, although sadly it's getting hard to find even here in its home state. After reading your blog, I did try drinking it without a bra on and found it to be a bit less dry that way. Haha, Holly Jean. Very funny! Glad you're enjoying it! I normally hate beer, but this brew in particular had me wanting more. Well that's awesome, Sarah! Your beer moment! For the past 3 years, I've heard a lot of similar comments. Lots of people love this beer. Let me know how that works out. Not a bad beer to test the waters. LOVE this beer. They better not stop making it! My new favorite lighter beer.